Custom logos - print or engrave your logo on any of our products for a fantastic promotional gift! Hundreds of businesses, organizations and non-profits have put their logo on our signature item, the CTM2710 Bottle/Can Insulator. It truly is the BEST promotional gift that you could give to your valued customers and employees. Two-sided printing/engraving is a great option if you want to share the cost with a sponsor! Pricing information for custom logo printing and engraving orders. * For quantities of 500+ units, please contact us with your specific needs. Shipping charges are dependent upon quantity ordered and customer location. (Please indicate if your order needs to be shipped internationally.) All shipping charges are based upon UPS Ground services. If a customer needs a shipment expedited after approval of the custom quote, any extra shipping charges will be applied to the order and payable upon request for the expedited shipping. 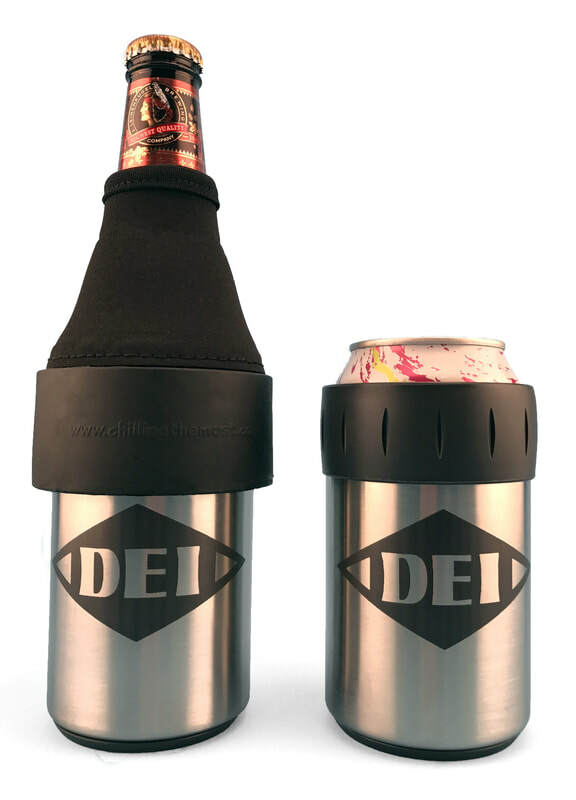 Minimum order qty for custom imprinting on the bottle/can insulator is 60 units. Other products and laser engraving services will vary for minimum quantities. Please email for more information regarding your specific needs. We do offer logo design services. Estimates are provided based upon customer need and design requirements. Payment via credit or debit card is due upon customer approval of final artwork. We cannot begin processing orders until payment has cleared. Normal turnaround time from submission of payment is 15-17 business days for delivery, except during the Holiday Season when orders could take slightly longer. Please allow plenty of time for production and delivery if you have an upcoming event, we cannot guarantee a timeline as we are dependent upon the production schedules of our printer and engraver. From family-owned businesses to large corporations. Non-profit groups to family reunions. Here are just a few of our satisfied custom logo imprint customers from the past. Increase the exposure of YOUR company or organization with a high-end promotional gift that will be used again and again.